The Rep said: Check out this stiff-ish, all-mountain freestyle board. Oh yeah, and our C2 Power Banana. Stats/Setup: I'm around 6'1" and 170# with size 10.5 32 Focus Boa boots caged inside Union Force SL bindings. I tested the 158 board and it was a demo day, so I only rode the board for a few runs. First Sight: What's up with that riser pad built into the board under the inserts? (I didn't get good pictures, check Lib's site) It felt pretty light swinging from my foot on the lift. Conditions: Resort in the rain. Hard to icy groomers with slushy pockets. The Ride: First, what I didn't ride: powder, pipe, rails. A damn shame we didn't have any powder, I've been wanting to test that C2 in the soft stuff and just haven't gotten a chance. That will have to wait. The dude-ditch and the metal features just don't attract me, so they're the last things I demo. Didn't make it there with the Dark One. I did, however, take the jump line through a notoriously slow, beginner park to test the other freestyle aspects of the ride. The combo of this board's light weight and pop had me overshooting landings that are all too easy to fail from lack of speed. Chalk one up for the new Dark. On the icy patches, Magne-Traction shines. This is no gimmick folks. It might not turn ice into pow like they say, but at least you can keep your board under you in some hairball situations. Couple that with a camber point at the tail from the C2 and this board was powering from one turn to the next. I found that the Org Throttle 3-d Riser (mentioned under First Sight) gave this otherwise narrow-ish board the heel and toe clearance of a wider board while still retaining edge to edge quickness and most of the board-feel. Still, I wonder if it's really necessary. 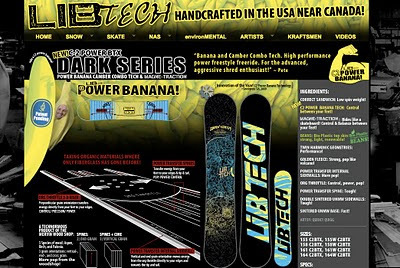 Bottom Line: The Lib Tech Dark Series C2 is a high-end, all-mountain freestyle board. With the C2 upgrade over last year's model it feels stiffer, more stable, more responsive and comes with added pop at the cost of buttery softness. Then again, if you wanted that, you'd be reading my Skate Banana review. The addition of traditional camber points suited this board perfectly. Big cliffs and park jumps with potato chip ridged landings will no longer scare you. Another cool quality of Lib Tech boards is that they're made right here in the USA (near Canada) in Washington state with more environmentally friendly features than you can hug a tree at. A bio-plastic topsheet made from beans? You know it. But all this technology comes at a hefty price. That's where the 'high-end' comes in. Suggested retail price of the Dark Series with C2: $666 (how's that for dark). If you don't fear the price (nor the reaper), take a walk on the Dark side. or peep Eric Jackson's part in Standard Films' Black Winter.